Ideal weather conditions and a strong Fan Appreciation Night crowd welcomed the INEX Ontario Legend Series to Canada’s Toughest 3rd of a Mile Paved Oval – Saturday, June 6th – for the second time on the 2015 schedule. A solid field of 20 lightning fast INEX Ontario Legends Series machines rolled from the Peterborough Speedway staging area for a 25 lap main event that closed an exciting night of action with Cole Ledson and Brian Saunders pacing the pack. There were amazing battles throughout the field. Former series champion Kevin Foisy advanced from his starting spot inside the second row and took control with 5 complete, as Nicholas Ledson, Saunders, Cole Ledson and Cole McFadden filled-out the top 5 positions and were hot on the tail of the lead dog. The field was going through lapped traffic by the time 10 laps were completed and appeared the green flag feel of the event would come to an end when Saunders – the opening night winner – spun while working around a back-marker coming off the 2nd turn. The driver of the #15S machine kept going and lost only 2 positions in the running order. 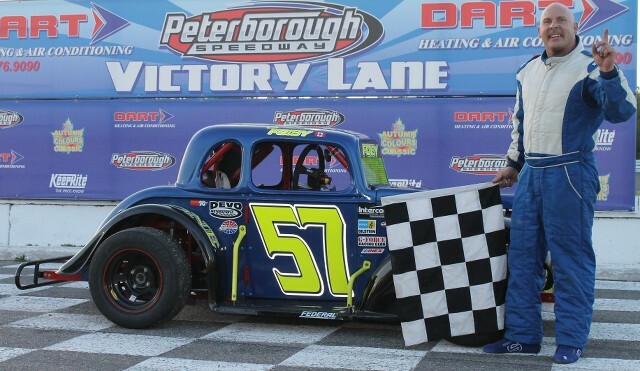 In stark contrast to their previous visit, the INEX Ontario Legends Series feature race went caution-free, with Foisy taking the win over Nicholas Ledson. Saunders rebounded to finish 3rd. Cole Ledson and Jamie Riberdy completed the top 5. Cole McFadden, Terry McClelland, Bill Mason, Michael Glaze, Duane Cinnamon, Brandon Thurlby, Robin Jongen, Don Arnott, Jamie MacArthur, Mark Griffin, Willy Howells, Nolan Gould, Parker Traves, Robert Richardson and Rob Black rounded-out the feature event running order. Kevin Foisy and Nicholas Ledson shared the Ontario Legends qualifying heat races. INEX Ontario Legends Series notes: Former Capital City Speedway regular Nolan Gould, Robert Richardson, Rob Black and Parker Traves all made their 2015 series debut. For Traves, it was his first time in a racecar of any kind…Colborne, Ontario’s Bailey Brown missed the event. The sophomore runner was spotting for her father Linc at the APC Pro Late Model race at Flamboro Speedway. The INEX Ontario Legends Series returns to Peterborough Speedway Saturday, June 20th. Fans can find complete schedule and event details by visiting www.ontariolegends.ca. The INEX Ontario Legends Series is supported by Clarke Motorsports Communications. Multi-time INEX Ontario Legends Series feature winner Kevin Foisy scored his first victory on the 2015 tour – Saturday, June 6th – at Peterborough Speedway.